I decided to take Bernard for a walk around the neighborhood over the weekend. I didn’t take my camera because I wanted to pay full-time and attention to Bernard. Normally Don or Ellsworth would have come along, but it was just Bernard and me this time. As always, Bernard did great, but for Ellsworth, you would’ve thought the world was ending. The running, the pacing, the braying… oh my. When I returned with Bernard, it was a beautiful thing. Yup, they’ll always be inseparable, those two. awwwwwww!!! Everyone needs someone to love them like that! Such lessons to learn from our 4-legged companions. Also need to tell you I LOVE your blog. Thank you for sharing your pets with us. Brings a smile to this gals face every day! Ellsworth N-E-E-D-S Bernard! 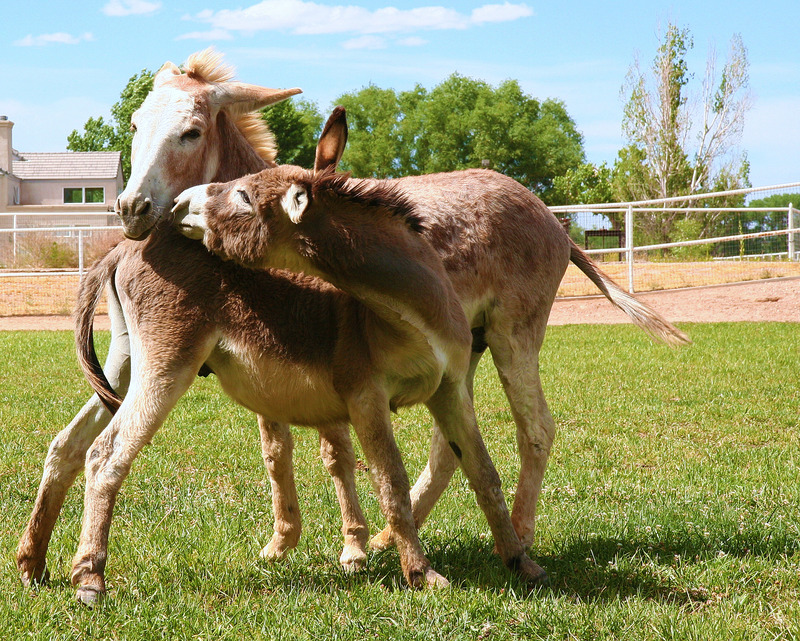 …his own little security burro. All the food and the comfort is nothing, I gather. Bernard is “home” for Ellsworth. Such a bond … such a neat story and photos. How cute. 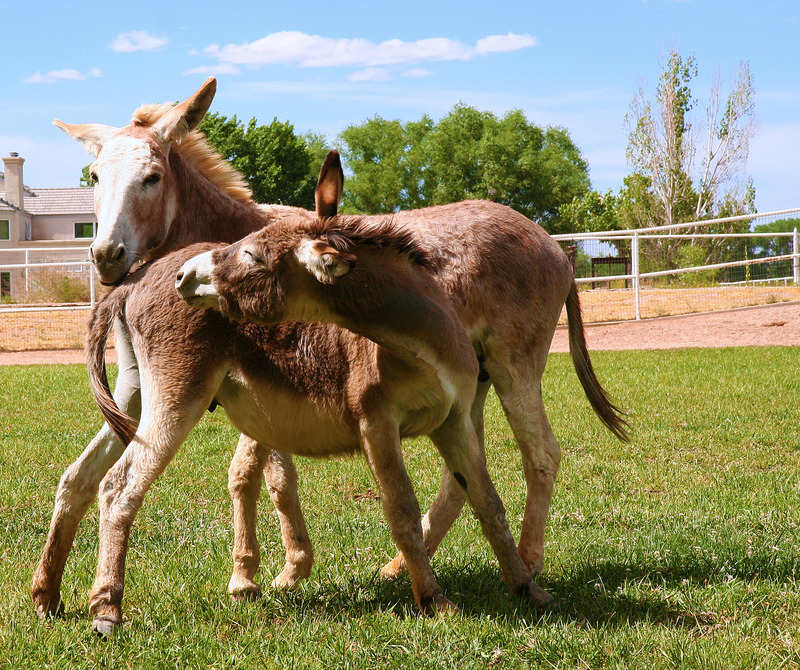 He knows he is responsible for all the donks, and thought his little Bernard had wandered away and gotten himself lost from the herd. Or, maybe he thought Bernard had worked his way into your kitchen and was eating all the cookies before they could make it out the door to the barn yard! That would definitely be “pace worthy”. Love the pictures. You can almost feel the relief! How cool that you can get Bernard to go for a walk with all that carrying on back home. That tells me Bernard loves and trusts you as much…or more than…as herdmates. True friendship is a rare and beautiful thing….How long was Ellsworth upset? 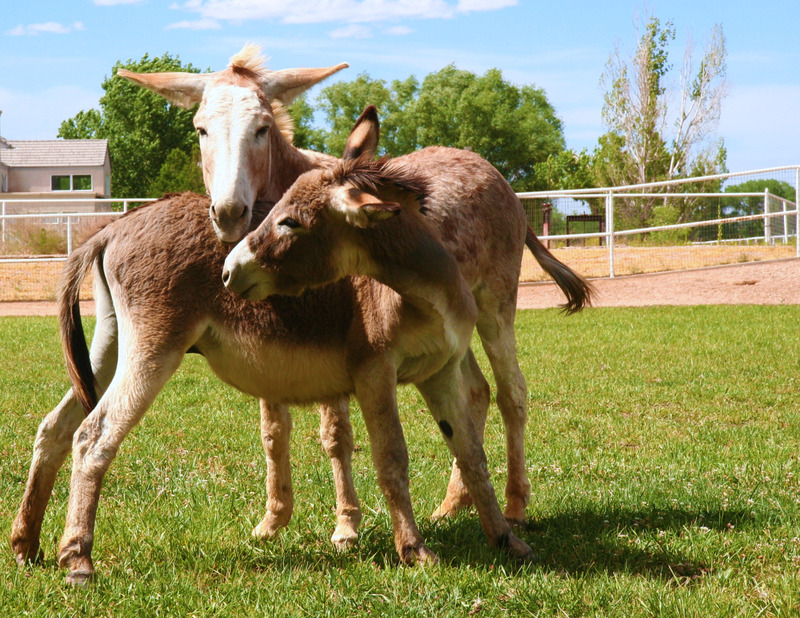 Ellsworth was upset from the moment Bernard left the corral until the second he returned. All in all, it was about half an hour. How absolutely endearing and heartbreaking, all at the same time. Ah, the bond between our furry family members. Two of our donkeys are like that. Cookie and Doughnut are inseparable. In fact, it is so bad that Doughnut gets upset ( braying, grunting, then comes the runny poo) if I take Cookie out of the stall to get her feet trimmed. They are stalled together so as to keep Doughnuts anxiety down. Cookie isn’t anywhere near Doughnuts anxiety level. And I make sure to get Cookie’s feet trimmed in front of the stall so Doughnut can see her. Like Linda, I’m amazed that Bernard went w/o causing a fuss himself. The photos of these two is sooo special. I just love how they are so bonded and inseparable. Everyone needs a best friend and they have it in eachother. Thanks for sharing this. I was thinking the same thing as Linda (Carson) – you are very blessed! Chester used to *love* going for walks with me – until Beau arrived – now he’ll still start off with me, but when Beau starts to fuss and pace back at the gate, Chet turns right around and literally tows me back to the barn. If I remember correctly, Bernard was first and then you got Ellsworth? How wonderful that they has bonded so strongly. Does he respond the same way if you take Fergus out? Is it a “herd leader” thing or a Bernard thing? Love how Ellsworth is hugging Bernard. And how limber Bernard is. Does he do yoga? Correct, Bernard was first, then Ellsworth. I haven’t taken Fergus out yet (still working on getting a halter on him) to know if Ellsworth would have the same reaction with Fergus, but I can tell you that neither Fergus nor Nigel cared one bit when I took Bernard out. We separated Fergus and Nigel in different sections of the corral when we dewormed everyone a few weeks ago. Nigel was the one who freaked out then – pacing, pawing and showing significant signs of distress. Interestingly, Bernard doesn’t freak out when we take Ellsworth out. Sure, he wants to see what’s going on and definitely shows his curiosity, but he doesn’t show the same signs of distress. I find all of this behavior fascinating.